The driver's seat is primed and ready for your skilful hand, will you escape the mines alive? Click here to play! Race through caves paved with gold in this exciting slot, and walk away with the champion's jackpot. 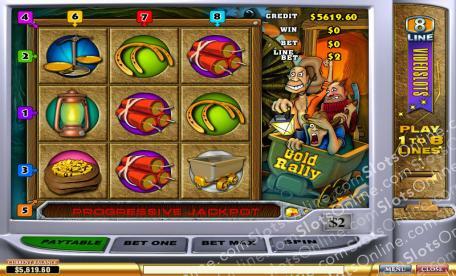 Gold Rally is a speedy slot played across 8 pay lines. The 9 reels are slightly different as they are set out in a 3 by 3 pattern, which makes for extremely interesting spins! There is an exciting Bonus Round that you can enter, and it contains several rounds to win in. The Scatter symbol is the Scales, and they may appear anywhere on the reels, just like Bonus symbols, in order to earn a payout on winning combinations. Speed up and escape the dastardly tunnels before its too late, and don't forget to win some massive progressive jackpots while you're there! The Scales are Scattered and can therefore appear anywhere on the reels in order to earn a payout on winning combos.